This Arts & Crafts inspired bookcase is the perfect corner bookcase for your office, living room, play room or den. 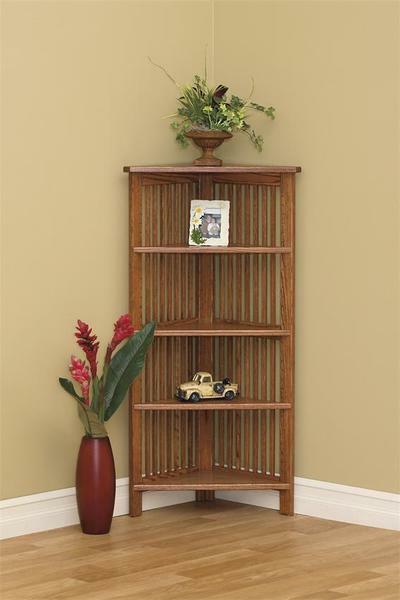 Select one of the six different sizes available for this Arts & Crafts corner bookcase to fit your space perfectly. Organize your books and office essentials on the sturdy solid wood shelves of this mission style bookcase. Proudly made in America from premium North American hardwoods and ships completely assembled so it is ready to be used as soon as it arrives at your home or office! At DutchCrafters we offer a wide variety of Amish office furniture all handcrafted from solid wood. Check out our entire collection to find the perfect pieces to go with this Arts & Crafts Corner Bookcase.